Most of the times, acne appears in teenagers and young people in their early twenties. However, people in their thirties and even forties can also suffer from pimples. Severity of the condition varies from person to person. Non-inflammatory acne often takes the form of a closed comedo, or whitehead. This occurs when the plugged hair follicle stays beneath the surface of the skin, and appears on the skin as a small whiteish bump. An open comedo, or blackhead, occurs when the plug enlarges and pushes through the surface of the skin. Its dark appearance is not due to dirt, but rather to a build up of the dark pigment of the skin called melanin. Blackheads are also a type of inflammatory pimples. The mildest form of inflammatory acne is a papule, a small, firm, pink bump appearing on the surface of the skin. These bumps can be tender to the touch, and are often considered an intermediary step between non-inflammatory and inflammatory pimples. There are many different types of blemishes that you can get on your face. They are all generally called acne but when it comes to treatment, it is important to know exactly what is going on with your skin. People with acne are usually familiar with whiteheads (milium), however they don't know what causes them or how to get rid of them. The difference between this and a blackhead is that blackheads are exposed to oxygen which causes the black appearance. If you are experiencing a problem with whiteheads, there are many treatment options available that could clear your skin right up. You do not have to see a dermatologist to get this medicine, even though it is recommended by most of them. Using a deep pore cleanser can prevent whiteheads from ever forming. It could also help to gently dislodge existing spots over time. Even though the chance of scarring from a whitehead is very unlikely, you should still never attempt to remove them yourself. It will only damage your skin and cause an infection. The contents leaking onto your skin can also cause more pimples to form. A doctor can remove them individually for you in his office, using sterile tool. What's The Real Cause Of pimples? No, it's not bacteria that's ultimately responsible for your pimples. If that would be the case, then the only thing you would have to do is to apply some benzoyl peroxide or other stuff that kills bacteria and be done with pimples. Since you are reading this article I presume that you know that it's not quite that easy. The real cause for your pimples is that your body is over acidic toxic. Let's take a brief look on how these toxins accumulate into your body and how they cause your acne. Once these toxins build up, your kidneys and bowels can get overloaded and clogged up, causing them to not function properly. When that happens some of the load will be dumped onto your liver. This means, your liver will be doing some of your kidney's work. Over time your liver also gets overloaded and it can't handle all the incoming acids/toxins. What happens when your bowels, kidneys, and liver gets overloaded? When that happen your body will expel toxins through your lungs and skin (your secondary channels of elimination). What happens when these toxins are all over your skin and your body is pushing in more? All those pimples -causing bacteria suddenly finds your skin to be a very fertile ground to settle in. And this is when acne occurs. This is when your skin starts to breakout. Harmful, acne-causing bacteria will not be able to survive in a clean, alkaline skin. You know the old saying that rats don't come to a clean house. Well, it's the same with acne and your skin. But whatever the toxic source is that‘s causing this problem, acne is a sign that your body can't cope up with all the toxins and it needs to resort to emergency measures. It is a sign that your liver is growing weaker in its detoxification abilities (and it will continue to grow weaker if you do not do what it takes to get rid of the toxins in your body). So if you think that pimples is your only problem, think again, your liver, kidneys, and bowels are getting weaker every time you breakout. All of us are prone to getting acne at some stage of our lives, especially during puberty. Acne is usually a result of over stimulated hormonal activity which cases the oil producing glands, or the sebaceous glands to produce more oil than necessary. This oil, whose purpose is to keep the skin moist, then combines with the dead skin cells, which are constantly being shed by the upper layer of our skin, to block the skin pores. Blocked or clogged skin pores, which are visible in the form of blackheads or whiteheads, can become inflamed and form lesions which we commonly call pimples. Prime targets of acne are pubescent adults. The body is experiencing many changes at this time and hormonal activity is at its peak. Some teens experience only a mild outbreak while in other pimples can be severe and chronic and requires the attention of a dermatologist. Unfortunately this is also the time that adolescents are developing their own personality and acne, especially in its severe form can hinder this as it can cause social embarrassment, shyness and a general drop in self –esteem. Parents and guardians are advised to keep channels of communication open with their children and help them seek professional advice from a dermatologist. Adolescent women also often experience acne during their menstrual cycle, again due to hormonal activity. Women can also get acne as a reaction to the cosmetics they use. Teenage boys are more likely to have severe and persistent pimples problems. Acne in babies is a common problem and usually begins after the baby is a few weeks old. It is probably triggered by the maternal hormones, which cross over to the baby through the placenta in the final moments of the pregnancy. Among other positive effects, like maturing the lungs, these hormones stimulate the oil glands on the skin, eventually giving rise to baby acne. Baby pimples does not require any treatment except gentle cleansing with water and maybe a mild soap. Do you wish to get rid of pimples over the night? And you are too stressed up for your appearance? What will help you clear your acne before the morning? Neither the stress nor the medication! Though stress can aggravate pimples, if not cause it. Popping seems the only way out. But don’t pop it anyways. This is the most undesirable trick to get rid of pimples and can damage your skin. That too, to leave behind the horrible scars that will require even longer the time to treat! Plus, popping of pimples can also prolong the life of the pimples. Popping of pimples should always be done in the presence of a surgeon. This will be a minor operation. As for you, if you really want to pop acne to clear it fast, keep a few things in your mind. Before you begin the process, wash your hands thoroughly. Use a sterilized needle to puncture it, slowly and very carefully. Wipe away the pus immediately. Don't do it for fun. Do it with the purpose. If you lose patience and pick, pinch or squeeze the pimple, you will have inflammation of skin. It will cause bacteria to spread to other parts of the face. The intended overnight solution, could lead to a fortnight's problem. The resultant scars sometimes take more than a fortnight to heal. There is another harmless method. Hold an ice pack on the pimple for about 2 minutes, and repeat this exercise for every 30 minutes. You will find marked reduction in swelling and inflammation. The pain too will subside. You can solve the problem for the day by the dose of a flesh-tinted concealer. You hide it or mask it for a few hours. The day's job is done and you can revert to your normal treatment. Wash the pimples affected area of your face with a mild cleanser. For exfoliation, gently rub the skin with a cotton pad or soft cloth. A dab of toothpaste in the affected area has helped many to reduce redness and provide relief from irritation in the skin. Put some lemon juice of a piece of cotton and gently press it on the affected area. The pimples will surrender their aggressiveness to a great extent overnight. These are some of the quick fix methods to get rid of the pimples overnight, or at least reduce their telling effect. The long drawn out treatment for pimples, needs to be carried out in consultation with the dermatologist. You need to give some thought and consideration to the type of makeup you use. And be sure to clean your tools regularly. Things such as cosmetic brushes get dirty and can carry bacteria and germs and may cause skin irritations and breaking out. One of the leading cosmetic authorities suggests that cosmetic brushes be thoroughly cleaned at least twice a month. A good way is to soak brushes for about 10 minutes in a dish of warm, soapy water using mild liquid detergent or baby shampoo. Rinse and blot excess moisture with a towel and stand the brushes, handle end down, in a tall glass until they are thoroughly dry. One skin care expert has come up with a do-it-yourself version of a treatment you may like to try. Stir the juice of half a lemon into one cup of plain yogurt. Keep it in the refrigerator and apply it as you would a cream every night before bed. You can even apply a thin coat of moisturizer over it is you like, after waiting about five minutes for the yogurt mixture to penetrate. With consistent use, you should see more even pigmentation and smoother skin in three to four weeks. Get serious about stress reduction. Skin conditions such as pimples appear on many people who are stressed out, and chronic skin conditions then to get worse. Set aside quiet time to meditate or daydream. Be sure to get enough sleep. While many mild forms of acne can be treated by over-the-counter products, more severe types may require medical attention. It is important to properly care for pimples and take the necessary steps to treat and prevent it, but it is also important to know when your acne requires you to see a dermatologist. The decision to see a doctor about your acne takes into account several things, among them, how you feel about your pimples and how it’s affecting you, and the medical facts surrounding your acne condition. There are several reasons why it may be a good idea to see a doctor about your acne. For one thing, severe acne may leave permanent scars, and medical treatment may help reduce scarring. Acne scars come in different types, and appear on some people while others do not have them. The type of pimples you have, and your skin type, both play an important role in how your acne scars are treated. The best way to prevent acne scars is to prevent pimples, so you should find what works for you and stick to it. If you have cystic acne, a more severe type of acne, painful cysts may need to be drained by a physician. This type of pimples usually requires medical attention because of its severity. It can also last for months and cause a good deal of discomfort to sufferers. Acne can also have negative psychological effects on people. It can cause them to become anxious or depressed, because they are constantly worried about their appearance. They may also fear how others see them, and feel there is no cure for this condition. This happens in adults because many feel their pimples should have cleared up after adolescence, or shouldn’t have occurred during adulthood. They are often afraid to place themselves in social situations where they might feel inferior, and often shy away from events. A physician can help treat the physical effects, as well as the psychological ones. Another reason to see a doctor is that teens who suffer from acne early on can usually expect it to worsen as they get older, and even continue on into adulthood. This can also mean more severe types of pimples have formed, and by seeking medical attention, scarring can be prevented earlier on in the course of the condition. Even if you aren’t sure, it can be a good idea to seek medical attention for your acne. Even if prescription medications aren’t necessary, a doctor can help you find a treatment that works best for you, and you will be on your way to recovery. Different treatment methods are used for relieving acne symptoms. These mainly include prescription medication, including both oral and topical medicines and home treatment. The most commonly used medication for treating pimples is Benzoyl peroxide. If it fails to bring relief, other oral and topical medicines are tried. Topical treatments include the use of azelaic acid (sold by the name Skinoren), retinoids (Adapalene, etc. ), and antibiotic lotions. Azelaic acid is an alternative chemical for benzoyl peroxide but it does not cause the skin to sore like benzoyl peroxide. Retinoids are medicines based on Vitamin A. They are rubbed into the affected area once or twice daily. Antibiotic lotions control the acne-causing bacteria. Acne is an extremely complicated skin condition that numerous individuals around the world suffer from. Pimples are the bumps or breakouts that are commonly associated with acne. This skin condition normally affects individuals that are from nine years of age to individuals in their forties. The pimples that an individual suffers from normally occur as any of the following: pores that are blocked, whiteheads, cysts, and blackheads. Pimples that are created by an infection can occur in a number of locations around the body. However, the most common locations are the face, back, and even the chest. The reason that these are the most common locations for pimples is because these areas contain the highest number of oil glands. Unfortunately, these areas are often the most noticeable – particularly the facial area. This is why sufferers of this devastating skin condition are most often embarrassed and disheartened. There are many different creative ways to eliminate pimples from your life. • The first and most important aspect to pimple removal is to ensure that you do not spread the infection. This means that you should not attempt to “pop” the pimples that you have. You should also ensure that you avoid rubbing them and manipulating them. Doing so can cause the infection of the condition to spread on your skin. • If you are trying to remove pimples from your body, you should focus on the areas where they reside, as well as the other areas in the body where they can develop. This will help you to completely eliminate and prevent an outbreak of pimples. • Many individuals who experience pimples make the mistake of using many different kinds of harsh cleaners on the infected areas. While there are some effective over-the-counter pimple treatments on the market, it is important to go easy on the infected areas when using these chemicals. If you clean your skin in a manner that is considered to be harsh, you may very well eliminate the essential oils and nutrients in the skin that are effective in fighting pimples. • If you suffer from acne outbreaks, you may consider taking a detailed look at your diet. There are many foods, beverages, and nutritional ingredients that may actually aggravate an pimples infection. Many individuals create a food journal and track the items that they consume in order to determine if there is a relation between the foods that are consumed and the pimple outbreaks that occur. • If you find that you have tried evaluating your diet, and have used numerous cleaning agents and have found no relief, you may need to make an appointment with a dermatologist. These skin specialists will be able to assess your acne situation and determine the best course of treatment. If you watch late night television then you have probably seen many “miracle cures” and products that you see advertised on the infomercials on how to get clearer skin and relieve your pimples. However, you do not have to spend big bucks on these acne treatment products, because a great way to get clear skin is just to go to your kitchen. Almost everything you need to clear up acne and have great looking skin is probably already there, in your refrigerator and pantry. A great way to get clear skin is the increase the variety of fruits and vegetables in your diet. If you throw in some nuts and seeds then you are already on you way to fabulous looking skin. Whether you choose to make a tasty smoothie with ripe fruit or eat at least one salad per day, these are perfect options to clear up your skin. Throw some Brazil nuts and pumpkin seeds on your salad as well because those contain selenium and zinc which work against the deficiencies of vitamins and minerals in your body that often causes acne. The next way to clear up your acne is just as easy. You should drink plenty of water. You’ve most likely heard this mentioned hundreds of times before, but yet people still aren’t realizing the complete benefit of plain old mineral water. By drinking at least eight 8 ounce glasses per day the skin becomes rehydrated and the dead skin cells are shed opening up your pores and clearing up your pimples. Your skin will look fresher and cleaner then ever before and you can literally see your acne disappear in just a few short days after starting the water treatment. The final way to clear up your skin is by adding what is called prebiotic foods to your diet. If you are currently on any antibiotics for your acne, then what you don’t realize is that they are essentially destroying the bacteria in your digestive system which can not only lead to poor digestion and constipation, but it can actually delete your body of essential vitamins and minerals that are causing more acne because the toxins are being expelled from your skin instead of through waste. Therefore, you may look great for a little while but the acne will come back unless you replace the friendly bacteria with prebiotic foods such as honey, artichokes, bananas, and onions. It is easy to add any and all of these foods into your diet everyday so that you can effectively clear up your pimples. Acne is not enjoyable for anyone. However you do not have to live a life with pimples if you just take the time to look into your refrigerator and pantry and add everyday foods to your diet. Not only will you start to feel better in no time, you will visibly notice your acne lessening the more of these foods into your body. Don’t forget the water though – it is one of the most vital ways to reduce acne. Can Acne And Pimples Come From What You Don’t Eat? The struggle we have of trying to rid ourselves of pimples and acne can be a very frustrating struggle. Especially since they eventually turn into scars that generally become very unsightly over time. This tends to play havoc with our self-esteem. In addition, our young people, and I’m talking about our sons and daughters, face continual hardship when their acne is really bad. Depending on how well a child has been nurtured and prepared by their parents, even a mild case of pimples can bring a surprising reaction from the child. Acne is the most diagnosed skin disorder in the United States. Let no one kid you, we are dealing with a monster here. It is a serious problem and we should treat it as such. Our primary approach to curing ourselves of pimples must come from the area of our diet. Did you know that prior to 1950, Canadian Eskimos, up to that point in their history, never had acne? Is that startling? Well how about this? When so called ‘modern food’ was introduced into their diet, along came pimples. I didn’t say that all efforts should be focused toward the diet. I said that our primary approach should come from the area of our diet. Blackheads, whiteheads, pustules, pimples infected sacs and cysts. We’ve been told countless times about the sebaceous or oil glands and how they get clogged. Then bacteria multiply, and along comes inflammation. Did you know that some people, a very few though, have pimples all their lives? How bad is that? In spite of all that, there is hope! Acne comes because of the things you do, and the things you don’t do. Let me explain that. When you eat too much meat, eggs, denatured flour, and white sugar, something inside of your body has to go awry. On the other hand, when you do not eat the more wholesome foods like fresh vegetables, whole grains and fruits, the body doesn’t get enough of the foods that it does need. How often do you get a bath? So you take good care of your outer body. How often do you bathe your inner body? What am I talking about? No one can wash and bathe the inner body? I beg to differ. When was the last time that you ate an apple? An apple washes and scrubs the inner body just like Mr. Clean does on the commercial. 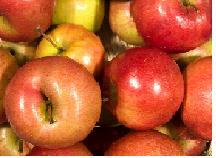 The old cliché that an apple a day keeps the doctor away may be time-worn, but it’s true. The action of an apple working on the inside of the body is truly amazing. Eat plenty of fruits. They wash, bathe and cleanse the inside of the body. The more natural the fruit is, the better it is for you. Only eat store bought canned fruits when you absolutely cannot get fresh fruit. Always wash your fruit before eating, and soak dried fruit, prunes and apricots. Including a variety of seeds, nuts, vegetables and fresh fruit in your diet can be a good control for acne. Drink plenty of water every day since dehydrated skin sheds dead cells which can lead to clogged pores and effective acne control. Most skin care products contain chemical ingredients that can aggravate acne. If you use make-up, try products that are non-comedogenic. Keeping stress levels low can also reduce the release of stress hormones and reduce the intensity of acne. Dairy products and red meat in your diet can cause acne. Heavily tanned skin can lead to blocked pores. Some of the acne control guidelines recommended by The American Academy of Dermatology are as follows. •	Do not squeeze, pop or pick at the acne lesion. This can spread the inflammatory process and worsen the acne. •	Wash your face twice a day gently with mild soap or sulfur soap. Just pat your face dry and do not rub it with a towel. •	Avoid oil based products. •	Avoid acne irritants such as airborne grease from fast food restaurants, rubbing or friction from sporting equipment etc. 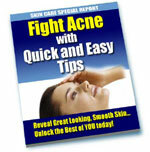 •	Give anti-acne products time to clear up the lesions. This can mean several weeks or even months. •	Some acne products increase the skin's photosensitivity. When in the sun wear a hat and use sunscreen and avoid tanning booths while using these products. Acne Cleansers have an important part in skin care. A good acne cleanser will remove make-up, oil build up, dirt and other debris from the skin's surface, preparing it for acne fighting treatments. Before the acne treatment, the skin has to be washed properly. Avoid using bath soap on your skin for cleansing. There are many kinds of skin cleansers in the market and you can choose the mildest cleanser for your skin. They are all natural and medicated cleansers and are great in controlling acnes. Some of the natural daily cleansers are as shown. Ingredients include herbal extracts that remove debris, impurities and excess sebum from the skin's surface to leave a clean refreshed feeling to your face. It can be used 2-3 times daily as a facial cleanser or make-up remover. It includes all natural, facial cleanser/toner/make-up removers. This acne cleanser uses the properties of orange extracts to remove impurities and dirt from the surface of the skin. This product does not clog pores and it keeps the skin clean and nourished and is great even for oily skins. The self foaming formula of this cleanser clears all make-up and impurities without harming the skin. The skin is cleaned and refreshed and can be used both in the morning and night. It is 100% soap-free and includes acne-fighting tea tree oil combined with gentle glycerin and chamomile extract to balance the moisture, creating a cleanser that prevents breakouts without drying the skin. This cleanser is excellent for removing facial make-up, oil and dirt. The clarity, tone, and texture of your skin can be greatly improved by using this instant, self-foaming acne cleanser. The tea tree oil has the natural properties for controlling skin problems and fighting acne causing bacteria. Due to the deep penetrating action of the foam, the skin is cleaned, leaving it fresh, and refreshed. Aloe vera is also proven to be great as an acne home remedy. Just make a juice out of it and apply it twice a day for the fast healing of your lesions. Cucumber will never be out of the list for beauty regimen. Apply a paste of it as a mask and leave it for 30 minutes. A paste of ground radish, as well as ground sesame seeds are also very good options when curing your acne. Paste or mask applied to the face is not only the way of curing pimples. As Aloe Vera Juice is a refreshing and anti-bacterial drink, you might find that taking this daily, diluted in some filtered water will not only cleanse your mouth and improve your oral hygiene, but also assists in dealing with any pimples issues you may also be experiencing that could also be assisting in the cause of pimples. This may be a build up of toxins and poisons in your system and the pimples symptoms you are experiencing is part of your bodies attempts to deal with them. You may find benefit from our information on Detoxifying through change of diet. Review this by looking at our article about balancing your Metabolic Rate. Further reading through our articles on pimples health issues will give you a body of information that will help you decide what options you have to deal with the underlying causes of your pimples problem through giving your body the nutrition products that will assist you body to heal from the inside out. We wish you well in your search for solutions to this pimples problem and your movement towards better health in all areas. There are many different types of blemishes that you can get on your face. They are all generally called acne but when it comes to treatment, it is important to know exactly what is going on with your skin. People with zits are usually familiar with whiteheads (milium), however they don't know what causes them or how to get rid of them. The difference between this and a blackhead is that blackheads are exposed to oxygen which causes the black appearance. Do big pimple on my skin. Why do pimple on my skin ? SITE DISCLAIMER: Do these products “cure” anything? Of course not… but it stands to reason that if you cleanse your body and feed it the finest nutrition available, giving it everything it needs in balance, on a daily basis, that your body will do what nature intended, and give you the best possible chance to fend off sickness and disease. This Pimples, acne, skin care, whiteheads, your health online information is not presented by a medical practitioner and is for educational and informational purposes only. The Pimples, acne, skin care, whiteheads, your health online content is not intended to be a substitute for professional medical advice, diagnosis, or treatment. Always seek the advice of your physician or other qualified health provider with any questions you may have regarding a medical condition. Never disregard professional medical advice or delay in seeking it because of something you have read. The resources on this site are not intended to be a substitute for professional advice. While all attempts have been made to verify information provided in this publication, neither the author nor the publisher assumes any responsibility for errors, omissions or contrary interpretation of the web site Pimples, acne, skin care, whiteheads, your health online subject matter herein. The site, acne, skin care, whiteheads, your health online contents are solely the opinion of the authors and should not be considered as a form of advice, direction and/or recommendation of any kind. If expert advice or counseling is needed, services of a competent professional should be sought. The author and the Publisher assume no responsibility or liability and specifically disclaim any warranty, express or implied for any products or services mentioned, or any techniques or pimples practices described. The purchaser or reader of this publication assumes responsibility for the use of these pimples materials and information. Neither the pimples author nor the Publisher assumes any responsibility or liability whatsoever on the behalf of any purchaser or reader of these, acne, skin care, whiteheads, your health online materials. There is no guarantee of validity of accuracy. Any perceived slight of specific people or organizations is unintentional. This website and its creators are not responsible for the content of any sites linked to. Since natural and/or dietary supplements are not FDA approved they must be accompanied by a two-part disclaimer on the product label: that the statement has not been evaluated by FDA and that the product is not intended to "diagnose, treat, cure or prevent any disease."